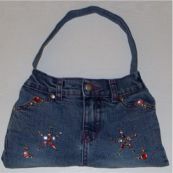 Jean purses are very easy and extremely inexpensive to make. 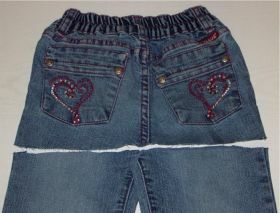 The next time you’re at a yard sale or flea market, look for some children’s or even adult size jeans. You can probably get a bunch for a quarter or fifty cents each — make them into a variety of jean purse styles and you can then get a booth at a craft fair, sell them to co-workers, give them as gifts or stick them on ebay to sell. I’m here to tell you there is MONEY to be made with jean purses. Here’s how to make some different variations – we know you don’t want to make just one style! After cutting off the legs, lay one of the legs out and measure a 3″ x 17″ strip. This will be used for the purse handle. NOTE: You can make the handle longer or shorter, depending on the length you’d like. Fold the strip in half with right sides together. 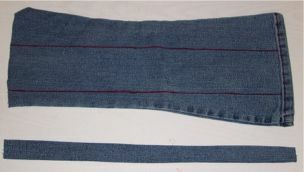 Sew a 1/2″ seam the entire length. Turn right side out and press with the seam in the center. 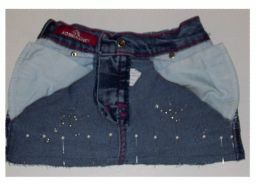 NOW is the time to do any bedazzling or attachment of beads, studs or embroidery work on the top jeans section, if you’re going to be adding rhinestones, studs, etc. Turn the top portion inside out as shown above. Position the pockets away from where the sewing line will be, as indicated. Pin the bottom opening then make a 1/2″ seam along the bottom. Zig Zag along the seam edge, or serge the edge, so it won’t ravel. Turn the purse right side out. Pin the handle to the sides and stitch in place. Use a velcro coin or two along the inside of the top opening for a closure. Add ruffles to the bottom or handle, or fray the edges of both. I’m sure you’ll come up with more styles once you get started and let your imagination go! 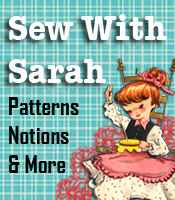 For additional fun projects and free tutorials, visit http://SewWithSarah.com. You’ll find categories for craft patterns, pattern making classes, pattern make-over tutorials and sewing patterns for women and men, plus size boys and girls, plus much more.